A properly installed lawn sprinkler system, paired with drip irrigation, can save a significant amount of water, time, and labor for most homeowners in Fort Worth. Homeowners looking to achieve a more attractive yard should notice the benefits of an in-ground sprinkler system soon after. The benefits, for example, outweigh the initial costs and repairs you may need throughout the year. Like most large purchases for your home, an in-ground sprinkler system can be considered a worthwhile investment if presentation and aesthetic are important to you. First off, an in-ground sprinkler system is quite easy to maintain. Some systems, once installed, are actually maintenance free, for the most part. While mowing, however, you will need to be aware of the position of each sprinkler head. On occasion, one of these sprinkler heads will malfunction, break, or perhaps even leak. Parts are easily acquired and can be replaced promptly by a professional. More infrequently, on the other hand, are power outages messing up the timing device. This is an issue that a professional can easily fix, despite its rarity. 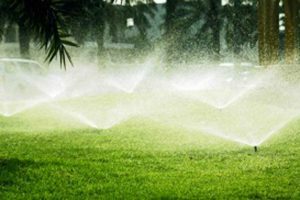 With the recent advances in lawn care technology, such as automated systems, an in-ground sprinkler system can be as simple yet complex as you choose. With a little patience and professional installation, a full lawn sprinkler system that is well-designed can cover more area and produce more efficient results. Those results include more lush grass, better growth from nearby plants and flowers, and less patchy areas of the lawn. Overall, a sprinkler system is a great investment for homeowners seeking a more luxurious garden. For more information on in-ground sprinkler systems, or to schedule an installation, contact Blooms Landcare at (817) 688-5352. We would be happy to discuss your lawn care options following a consultation appointment!